"Schizophrenic"was the word NY Times columnist Frank Rich used to describe the Bush State of the Union message. The first section of the speech, devoted to to domestic issues, continued the administration practice of using rhetoric at odds with its actions to try to put a popular face on policies that favor an elitist few. The latter portion of the speech, which attempted to bolster support for Bush's adventure in Iraq, offered no new evidence, and seemed, as Salon.com suggested in the lead-in to Jake Tapper's piece, designed "to scare the bejesus out of his audience." Bush did indicate that Secretary of State Colin Powell would present "information and intelligence" about Iraq's weapons program to the UN Security Council. Critics questioned why such information, if available, had not been provided to UN weapons inspectors. Of the two items Bush cited as achievements, one -- creation of the Department of Homeland Security -- was opposed by his administration until political pressure made that impossible. The other, what he referred to as "historic education reform," was at the time of its enactment labeled by the Boston Globe "an evolutionary move down a path that education has taken for more than a decade." Moreover, civil rights groups have called the funds designated for education in the current administration budget "a sharp retreat" from the funding levels "trumpeted" when the bill was signed. Despite Bush's claims that his economic plan would create jobs, in background briefings for reporters at the Davos economic forum and elsewhere, administration officials talked down the importance of the poor job market, arguing instead that their plan is about long-term growth. This change of tack is in part a response to widespread puzzlement from economists who see no connection between Bush's tax cut proposals, and short term economic stimulus. Like his previous tax cut plans, the savings will not go primarily to people who will actually spend it, or to public works that would benefit everyone, but rather to wealthy individuals who will add it to their savings, prompting Senate Minority leader Tom Daschle to label the proposal the "Leave No Millionaire Behind Act." Any short term effect from the elimination of federal tax on dividends -- perhaps the key provision of the Bush plan, and representing almost half its cost -- is mitigated by the fact that one-third of U.S. companies do not pay dividends. Increased unemployment tends to erode consumer confidence, yet, as the Economist observes, this may be more of a political than an economic concern. During the fiscal year ending September 2002 the U.S. economy was one of the fastest growing industrial economies, and was the fastest growing by the third quarter. I am proposing that all the income tax reductions set for 2004 and 2006 be made permanent and effective this year. And under my plan, as soon as I have signed the bill, this extra money will start showing up in workers' paychecks. Instead of gradually reducing the marriage penalty, we should do it now. Instead of slowly raising the child credit to a thousand dollars, we should send the checks to American families now. This tax relief is for everyone who pays income taxes and it will help our economy immediately. Ninety-two million Americans will keep this year an average of almost $1,100 more of their own money. A family of four with an income of $40,000 would see their federal income taxes fall from $1,178 to $45 per year. And our plan will improve the bottom line for more than 23 million small businesses. We also strengthen the economy by treating investors equally in our tax laws. It's fair to tax a company's profits. It is not fair to again tax the shareholder on the same profits. To boost investor confidence and to help the nearly 10 million seniors who receive dividend income, I ask you to end the unfair double taxation of dividends. These statements, previewed in a January 22 speech in St. Louis, MO, have been debunked by the Center for Budget and Policy Priorities (CBPP). 92 million Americans will keep an average of $1,083 more of their own money when this tax plan goes through... 80 percent of tax filers would receive less than the $1,083 'average' amount. About half of tax filers would receive $100 or less. The average tax cut would be $90,000 for people who make more than $1 million per year; the $1,083 average figure averages together high-income people who would get massive tax cuts, with the much larger number of Americans who would get small tax cuts. 23 million small business owners will receive an average tax cut of $2,042 under this plan... 79 percent of returns with small business income would receive less than this $2,042 'average' amount. 52 percent would get less than $500. As with the figures for individuals, above, the average is skewed by a small number of high-income filers with small business income who will receive very large tax cuts. Moreover, the Administration's definition of 'small business owner' includes a significant number of wealthy individuals who are passive investors in small businesses, but don't actually run them. By this measure Bush and Cheney themselves would qualify as 'small business owners.' The definition inflates the value of tax cuts that small business owners are said to receive. More than 40% of the people who receive dividends make under $50,000 a year. Many of them are seniors. Three-fourths of the people in America who receive dividends make less than $100,000 a year. The fallacy here is that no distinction is made based on the value of dividend income received by different individuals. Dividend income is distributed unevenly among individuals receiving dividend income. People with income below $50,000 represent 40% of individuals receiving dividends, but receive only 18.5% of all dividend income. They would receive only 6.7% of the savings under the Bush plan to end taxation of dividends. The effect is even more pronounced among the elderly. 43% of the Bush dividend tax cut would benefit the wealthiest 2.5% of the elderly (those with incomes in excess of $200,000). Two thirds of elderly Americans -- those whose annual incomes are lower than $50,000, would receive only 11% of the total dividend tax savings going to the elderly, and only 4% of the total dividend tax cut. A family of four with an income of $40,000 will receive a 96 percent tax cut. Here what is misleading is that the statement holds only for federal income taxes, and does not take into account payroll taxes. 90 percent of Americans with income below $100,000 pay more in payroll taxes than in individual income taxes. When one adds in the employee's share of payroll taxes, the tax reduction for the hypothetical family under the Bush plan is only 27%. Moreover, many economists conclude that employees essentially pay for their employer's share of payroll taxes in the form of lower wages. Taking into account both the employee and employer portions of payroll taxes, the tax reduction only 16%. The elements of the Bush tax plan that would benefit the hypothetical family -- acceleration of the widening of the 10 percent bracket, the increase in the standard deduction for married filers, and the increase in the child tax credit to $1,000 -- represent less than 25% of the overall cost of the package. So 75% of the Bush proposal does not benefit them. The Council of Economic Advisors said these proposals over the next three years will create 2.1 million jobs. While true, the CEA estimates that jobs created in 2003 (190,000) would just equal the number of jobs lost in the last two months. And although jobs could increase in the 2004 election year, after that the Bush plan would actually reduce the rate of job growth. CBPP finds this estimate consistent with the burgeoning middle- and long-term deficits to which the plan contributes. Lower taxes and greater investment will help this economy expand. More jobs mean more taxpayers and higher revenues to our government. The best way to address the deficit and move toward a balanced budget is to encourage economic growth and to show some spending discipline in Washington, D.C. The administration labels concern about spiraling deficits the "nonsense" of "Rubinomics." A recently released Brookings Institution study concludes, however, that almost all major macroeconomic models and academic studies suggest that long term budget deficits reduce national saving. In turn this results in reduced investment, a loss of confidence in the U.S. economy, and "upward pressure on domestic interest rates as investors demand a higher 'risk premium' on U.S. assets. The Bush administration's likes to blame "big-spending" Democrats for the budget deficit projections. Yet federal spending as a percentage of the Gross Domestic Product (GDP) has declined from 22.2% in 1992 (the last year of the Bush I administration) to 18.4% in 2001, according to Congressional Budget Office (CBO) figures. Asked in November about the federal budget deficit, Bush invoked the principles his father derided as "voodoo economics. "Well, we have a deficit because tax revenues are down," he said. "Make no mistake about it, the tax relief package that we passed -- that should be permanent, by the way -- has helped the economy, and that the deficit would have been bigger without the tax-relief package." This line of thinking, popularized by the perhaps appropriately named economist, Arthur Laffer, asserts that tax cuts will ultimately increase tax revenue because they stimulate the economy. Laffer's theories provided the ideological underpinnings for tax cuts during the Reagan administration. As we've discussed elsewhere in The Dubya Report, most economists have since reached a consensus (a rare thing in the field of economics) that, while there is an "economic effect" from tax cuts that partially offsets lost revenue, the net is still a loss. Eric M. Engen, an economist with the conservative American Enterprise Institute, told the Washington Post, "I don't know anyone who has said that the makeup in revenue because of the economic effect is greater than the reduction...." Jude Wanniski, an economics writer who popularized supply-side views in the Wall-Street Journal, agreed. "It's decreasing revenues," he said. A Wall Street Journal NBC News poll conducted at the end of January showed 49% of those surveyed disapproved of Bush's handling of the economy, and a whopping 61% doubted that the administration plan would do much to stimulate the economy. Speaking at a small warehouse and trucking business in St. Louis, MO on January 22, Bush dismissed opponents' charges that his plan primarily benefited the rich as "typical class-warfare rhetoric." As the NBC/WSJ poll showed, however, the public believes his opponents. 59% of those surveyed said the Bush economic proposals "benefit mostly the wealthy" rather than "benefit all Americans equally." And 42% favored economic proposals backed by Democrats compared to 37% for the administration plan. The editorial writers of the Boston Globe pointed out that class struggle on the scale that, for example, has been seen in Venezuela in recent weeks, has not been a serious possibility in the U.S. since 1930. It was Franklin Roosevelt's establishment of the Social Security system that mitigated the societal pressures of the Great Depression, and may have prevented what the Globe calls a "cataclysm." As the Globe further notes, Bush tried unsuccessfully last year to "diminish the guaranteed benefit that is the essence of Social Security." We will discuss the Bush healthcare proposals in more detail in a subsequent article, but we note that congressional Democrats have voiced concerns that changes to Medicare and Medicaid programs will force millions of senior citizens into private health care plans -- to the delight of the HMO and medical insurance industries. In December the Council of Economic Advisers and the Treasury Department began preparing documentation to justify a point-of-view that has until recently existed only in what the Washington Post called the "fringes of economic policy," namely the notion that the working poor and the middle class should be paying more taxes. J.T. Young, the deputy assistant treasury secretary for legislative affairs, sounded the alarm in Washington Times opinion article: "[Higher] earners cannot produce the level of revenues needed to sustain the liberals' increasingly costly spending programs over the long-term. . . . If federal government spending is not controlled, then the tax burden will have to begin extending backward down the income ladder." Chairman of the Council of Economic Advisers, Glenn Hubbard, voiced a similar view at a tax forum held at the American Enterprise Institute when he said, "The increasing reliance on taxing higher-income households and targeted social preferences at lower incomes stands in the way of moving to a simpler, flatter tax system." Attempting to counter the argument that the working poor pay a high proportion of their income in taxes when payroll taxes are included in the calculation, outgoing economic advisor Lawrence Lindsey suggested to the forum that Social Security was not really a tax, since it was returned to the taxpayer as a benefit. Conservative and liberal economists alike objected to Lindsey's extremist view. Speaking to Salon.com, Bill Ahern of the Tax Foundation, a group that advocates tax cuts, said, "the assertion that it's not a tax is something we disagree with." Bob McIntyre, of the Citizens for Tax Justice, chided "Don't count anything as a tax if you want. People still have to pay it." The flatter-tax pronouncements represent a reversal of the position Bush articulated while hawking his $1.35 trillion tax cut last year as a means to "take down the tollgate on the road to the middle class," and trumpeting its benefits for workers "on the outskirts of poverty." At that time, arguing that taxes were at a record high, Lindsey included federal income taxes, state taxes and the Social Security tax in their calculations. William Gale, of the Brookings Institution commented, "If payroll taxes are not a tax, then taxes as a share of GDP are at a post-World War II low, and therefore we should try to boost taxes to bring them up to historical levels. So the administration is being hypocritical if it counts payroll taxes when it wants to say taxes are high and then doesn't when it wants to say taxes are low." 21 percent of the nation’s before-tax income flowed to the top one percent of the income spectrum in 2000, up from 14 percent a decade ago. 35 percent flowed to the top five percent, up from 28 percent. In 2000, the IRS stated that the average income of the top one percent exceeded $1 million. In 1998 the top one percent received a larger share of the nation’s before-tax income than at any time since 1936. Despite the fact that those at the top of the income spectrum pay a larger share of federal taxes than in the past, their after-tax incomes have grown more rapidly than any other group. According to CBO, the average after-tax income of the top one percent grew by 157 percent, or $414,000, between 1979 and 1997, after adjusting for inflation. By contrast, average after-tax income rose just 10 percent for households in the middle of the income spectrum. Between 1989 and 2000, the average before-tax income of the top one percent grew by 78 percent after adjusting for inflation — with their average income exceeding $1 million in 2000. The income of the next highest four percent grew by 29 percent. The average income of the remaining 95 percent of tax filers, on the other hand, grew only nine percent over the period. By comparison, the economy as a whole grew by 40 percent over this period. IRS data show that the average income, after federal income taxes are subtracted, of the top one percent of tax filers grew by 69 percent between 1989 and 2000, after adjustment for inflation. After-tax income grew 26 percent among the next highest four percent of tax filers. The after-tax incomes of the remaining 95 percent of tax filers grew an average of nine percent over the same period. Rep. Robert T. Matsui, Democrat of California and a member of the House Ways and Means committee observed to the Washington Post, "I don't think there's any question you have a number of extremists in the Republican ranks that would like to see the wealthy do very well. They're going to try to make the case that the average American is overtaxed and subsidizing the poor." Rep. Charles Rangel of New York, the ranking Democrat on the committee agreed. "These people are setting the tone in saying the poor really are not being taxed enough and that the burden is too high on the rich," he said. "We're going back some 70 years." "The president is making the case that people who earn between $50 [thousand] and $75,000 a year should be paying a third more taxes," Matsui added. "I'd love to debate him on that." Academic observers were puzzled by administration statements. "I would be very surprised if the agenda is to put more people on the tax rolls," said Michael J. Graetz, a Yale University law professor and tax reform expert. "That doesn't seem like a good political agenda." The administration position seemed ready-made to be labeled as an attempt to tax the poor. William W. Beach of the conservative Heritage Foundation agreed. "It's hard to conclude it's anything else," he said. Critics like political commentator Kevin Phillips suggested that the administration was focusing on dividends because other items on the conservative agenda, such as corporate tax cuts, were politically dangerous in the context of the wave of corporate scandals last year. "This is so flagrant," Phillips told the New York Times. "It's not aimed at the little investor. It's aimed at the big investor and shrouded by a fog of phoniness. This isn't even trickle-down economics. It's mist-down economics." The value of the dividend tax cut is estimated at approximately $300 billion, or half the value of the entire plan. Most people who own stocks own them in tax-free accounts like a company 401K plan, or an Individual Retirement Account, hence do not pay taxes on dividends anyway. Again those who will benefit are primarily the wealthy, who are more likely to purchase stocks as individuals. Democrats suggested a big budget increase to the Securities and Exchange Commission, and backing aggressive action by the accounting oversight board would be more likely to restore investor confidence. "That's what will bring back confidence in the stock market," said California's Robert T. Matsui, "not some gimmick like dividend deduction." "There are a number of Democrats who voted with him on the last tax cut, and also a number of Republicans, who are not willing to just accept this one as a fait accompli and take it as it is," Senator John B. Breaux, Democrat of Louisiana, told the New York Times. The dividend tax cut would have to be "replaced and/or dramatically scaled down." Breaux's support was crucial to the passage of Bush's 2001 economic plan, when he helped the White House find 12 Democratic votes in the Senate. Prominent Republican members of congress voiced concern, as well. Senator Charles E. Grassley, chairman of the Senate Finance Committee, said Mr. Bush's plan was not likely to pass intact. Mr. Grassley, who helped push through the 2001 tax cuts, said he believed he could negotiate a bipartisan bill that would win the support of a majority of senators, but warned that the Bush plan was not likely to pass in its current form. A potential political problem for the administration is the penchant of extremists like House Republican leader Tom Delay of Texas to pass even larger tax cuts than those proposed by the administration. "I look at the Bush plan as a floor not a ceiling, Delay said. Meanwhile, moderate Republican Senators like Lincoln Chafee of Rhode Island, who voted against the first Bush tax cuts, and Olympia J. Snowe of Maine, have expressed concern over the huge deficits created by the Bush economic plans. Chafee, together with Dianne Feinstein of California who voted for Bush's 2001 package, introduced legislation in January that would freeze the top income tax bracket until budget surpluses return. The measure would have the effect of blocking a provision of the 2001 tax cuts. Economic results for the past year, however, tend to support those, like Krugman, who predicted a so-called "jobless recovery" as occurred during the first Bush administration. While the Gross Domestic Product (GDP) has grown, employment has continued to shrink. European observers have suggested that the balance of trade deficit may be of more concern in the short term than the federal budget. (The balance of trade deficit is the excess of value in goods imported to the U.S. over goods exported from the U.S.). The trade deficit already exceeds 5% of the U.S. Gross Domestic Product, and continues to increase. Since many imports are purchased on credit, the trade deficit can be said to be funded by consumer debt and international money (the ultimate creditors). Much of the same money is also invested in the U.S. stock market. If investor and consumer confidence drop precipitously at some point, the U.S. economy could suffer a tremendous blow as international funds are reinvested outside the U.S. From the European perspective the balance of trade deficit is particularly disturbing because it is by some accounts the primary source of European economic growth. 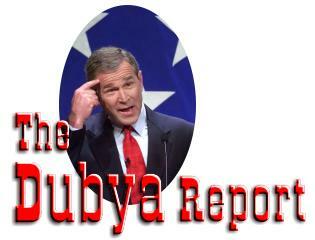 It is unclear why Bush would undertake a series of controversial economic measures at this point in his presidency. What will be important for his re-election prospects is how the electorate feels about the economy. As things now stand, however, his political legacy will be that of a president who came to office with surplus projections well into the future, and left what the Economist calls "an open-ended return to deficit-run government." As for the Democrats, perhaps the best advice is the Boston Globe's suggestion for turning the "class warfare" rhetoric around. The Democrats ought to engage Bush in a debate, running through the 2004 elections, about programs the government might develop to use the great wealth of the nation to ease burdens on Americans with modest incomes. Bush will no doubt say this is another example of class warfare, but it would really be an attempt to build a society in which the chasms of wealth are bridged by the ethic of shared responsibility. That would foster class amity and strengthen the nation. Harwood, John and Greg Hitt "Bush's Handling of Economy Draws High Disapproval Level" Wall Street Journal 23 Jan 2003. See also Brad DeLong's Whitehouseology, and the Washington Post's "Chronic Budget Deficits Forecast".